Have you ever wished that God was like a genie in a bottle? And maybe you could get just three wishes: perhaps a long, healthy life, marital bliss, and a financial fortune to enjoy? Well this little excursion promised to be just that! But it didn’t turn out that way! And by the time I returned from this little island experience, I lost most of my hope that God is perhaps a “genie in a bottle”, or some kind of a, “heavenly goose that lays golden eggs”! We arrived at a little resort on the Pacific ocean. We parked our car, and went over to the little ferry, which would take us to this little island resort (Not the island picture to the right, of course! Just a very tiny island.). The spirit began in a sort of mocking way, “Oh yeah, this is your fantasy! This is your fantasy!” And actually, it did somewhat remind a person of Fantasy Island. Very beautiful and jungle-like. So we boarded the ferry, and in a very short time, we arrived on the island. But the spirit kept telling me, “Yes Chuck, this is going to be your fantasy Island!” And so I was anticipating some sort of exotic mystery, which would be a welcomed respite from the torment that I had been going through! Maybe I was to find riches here! Or maybe some promise of future glory! By the way, for your information, Fantasy Island was a hit TV series, in which various people went to a resort to have some semi-magical or semi-mystical dream-come-true` experience. And there was often a life-lesson that would be learned by the participants, by the end of the show. FANTASY ISLAND… Airing from 1978 to 1984, the original series starred Ricardo Montalbán as Mr. Roarke, the enigmatic overseer of a mysterious island somewhere in the Pacific Ocean, where people from all walks of life could come and live out their fantasies, albeit for a price. 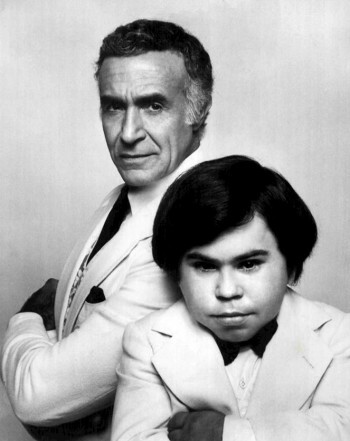 Roarke was known for his white suit and cultured demeanor, and was initially accompanied by an energetic sidekick, Tattoo, played by Hervé Villechaize. Tattoo would run up the main bell tower to ring the bell and shout “De plane! De plane!” to announce the arrival of a new set of guests at the beginning of each episode – Information courtesy Wikipedia. Anyway, I don’t know how important any of this is. Just telling you what happened. Photo Hawaii, courtesy Wikipedia under share-alike license. Link here to photographer, Julius Silver. So we arrived on the island, and immediately rented a little bungalow. It was only about $15 or $20 American dollars per day, which even back then, was a bargain for an ocean-front resort! And of course, I was totally focused on what the spirit h ad in store for me, especially with his suggestions that this was gonna be some sort of Fantasy Island experience. I wondered about what might happen to make this experience like that TV show. I honestly was looking around to see if there was some sort of Mr. Roarke, or at least a Tattoo. But there was no Mr. Roarke here to conduct anyone’s fantasy, and not even a little “Tattoo” riding around in a golf cart! It was obvious that the spirit had something else in mind. But what? I was hoping for something magical or even mystical. After all, I knew I was dealing with spirits with powers beyond anything I’d ever imagined! And so I knew these spirits were well capable of bringing about whatever was in-store for me. Not long after we arrived, Becky decided that some other family members needed to be here. So she went back to Guatemala City. I stayed on the island. And so, with the spirit having such a gift of gab, and always willing to TALK MY EAR OFF, there was not a moment of boredom here, (nor of silence). And so I merely roamed the little island, sometimes sitting under the shade of a palm tree, and talked with the spirit. And mostly, I remember that he went over and over on this burning question, as to just who I was in a former life….Jesus….or Hitler. But I must say, most of the time on this Fantasy Island, he inundated me with the possibilities of me being Jesus (in a former life), and of all the glorious things awaiting me. This inconvenient event happened a number of years earlier. I was an atheist. But I tried to convince myself that abortion wasn’t murder. But the thought kept coming back to me, that having an abortion would be preventing a life from coming into the world. So it was an undeniable fact that this abortion too, would be preventing a life. So upon deciding to have one anyway, I tried and tried to get this thought out of my head. But I couldn’t! I just couldn’t! This inescapable truth kept coming back again and again to haunt me, even though I was an atheist, back in those years! But on the day of the scheduled abortion, my girlfriend had a miscarriage. At least that’s what I was told. “That little girl you had, or should I say, almost had, was the soul of Mother Mary. You killed Mother Mary, Chuck! God was going to bring Mother Mary back into the world! And you killed her! You murdered Mother Mary!” The spirit was now telling me that, my insisting on her having an abortion put a stress on her, ultimately causing my girlfriend to have the miscarriage. And so began the spirit to bombard me with guilt about this sad chapter in my past. “Do you know what that little girl’s name was going to be that you killed? I had never really thought about this. “You were going to name her “Heather”. At this point I felt horrible. Not only was I responsible for that miscarriage, but that child had the soul of Mother Mary! And now the spirit was personalizing this by telling me the name that would’ve been given her: Heather! Anyway, I was wearing a ring my old girlfriend gave me. It was a gold band with my birth-stone. All I could do was just to take this verbal whipping! Then the spirit reminded me of an incident that I went through a few years earlier, when an old school friend came by to visit me while I was working at the restaurant. He just showed up one day at the restaurant. He was dressed all in white peasant shirt and pants. Clothes you might expect to see on a person living in the tropics. And now that I think of it, he did say he was now living somewhere in the Hawaiian Islands. RING OF FIRE… My old friend was saying some strange things! And at one point, he saw this very same ring now being discussed. He told me it was a very special ring, and that it glowed with an aura emanating from it. He asked if I would take it off. So I did, and gave it to him. He started dancing around the banquet room, with this ring, saying weird things about the ring: that the ring glowed. He talked about the ring as if it was of great importance. He then climbed on one of the banquet room chairs, and held the ring as high as he could. He was saying something about the ring being very high or something like that. Making such a big deal about a ring! “Poor guy”, I thought, “He’s really flipped out!” My old school buddy and his white suit was totally off his rocker! Now, years later, the spirit was reminding me of this incident with my old friend and this ring. “He was prophesying to you Chuck. I was controlling him. He was telling you how precious was the love given you by that girl!” I had little trouble accepting what the spirit was telling me. As a matter of fact, I still believe that my old friend in white was being led by spirits. His behavior was so bizarre that day! “I want you to take that ring and toss it into the ocean! Toss it you no good …”!#$&%! ?%$”!” I began to walk down to the black sand beach that was only a hundred yards away, looking at this special ring. Overwhelmed with guilt of how I rejected her love. “God really hates you because of how you treated her. And she only gave you love! Toss that ring you no good SOB ! !” And so I took this nice ring and tossed it as far as I could into the ocean. I really felt bad about the way I treated so many girlfriends. And I really never realized how heartless I could be at times. 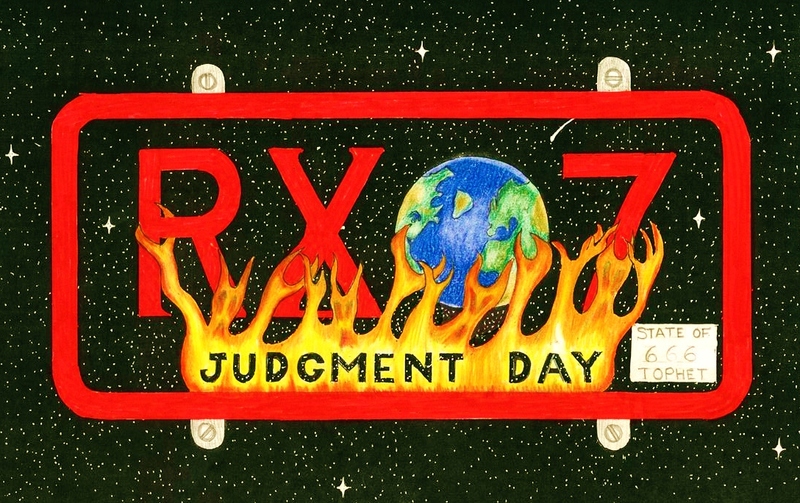 Because of this experience and others, I became a changed person. In the future, I would try to be more honorable. Not that I was perfect, because I wasn’t. Just better. Now Becky arrived the next day with her family. So things became much more lively. Now this little island had several large swimming pools, and an open-air restaurant. Becky’s parents also came there. We all had lunch on the patio of this restaurant overlooking the ocean. The waitress took our order. They ordered Spanish food. I ordered a chicken salad sandwich. The waitress soon brought our food. I opened my chicken salad sandwich to inspect it. Upon opening it, I saw a big fat oversized black fly still in mint condition, laying there in the chicken salad, hidden under the bread. I lodged my complaint in English, and it was interpreted to the waitress And after a little discussion, Becky told me the waitress replied, “just take it out”. I objected and my objection was interpreted back to the waitress, saying that I wanted another sandwich (Which, of course, would be standard procedure in America!) In a few minutes she came back with “another sandwich”. I opened it and there was no large fly in it. But there appeared to be an indent in the exact same spot where the fly was located in the “other” sandwich! And after thinking about it for a few moments, I gave up and decided to make no further objections… and just eat the stupid sandwich! Now why am I telling this little story? I don’t know. I just thought it was a funny story. But anyway, in a few days I would be eating something far worse than flies! Belize wikipedia share-alike license. By Eseiglihp. (Sunset on Caye Caulker). Click here for link. WHERE’S DE FANTASY, MR. ROARKE? After a few more days, Becky and I got back on that ferry that brought us to this island. And in a few minutes we were back on the mainland. But I guess it was kind of anti-climactic, considering I was led to believe this was going to be some sort of fantasy. But that’s what happened. I was somewhat disappointed that nothing magical happened, like it often did on that TV show. And there was no little fella named Tattoo running around the island either. And there was no fortune! No promise of future glory! And if that isn’t enough of a wash-out, I just found out another disappointing fact. W e weren’t even on an island! We merely took a ferry across an INLET OF WATER ALONG THE COASTLINE because it had no bridge! What a disappointment!… NOT ONLY WAS THERE NO FANTASY… THERE WASN’T EVEN AN ISLAND!!! Now if that’s still not enough of a wash-out, I was also later told that after we left there, a big Pacific storm came along and completely destroyed the entire resort! Well, it serves them right for sticking that fly in my chicken salad sandwich! Not really! Actually, I would go back there, flies or no flies! It was a really nice and inexpensive resort! When we arrived back home at Becky’s parents, the weather became cloudy. At night there was a thunderstorm. I went up on the roof, because I learned by experience, that the spirit would answer questions using the lightning. Up on the roof, it seemed like I could see across all the houses and townhouses for blocks. 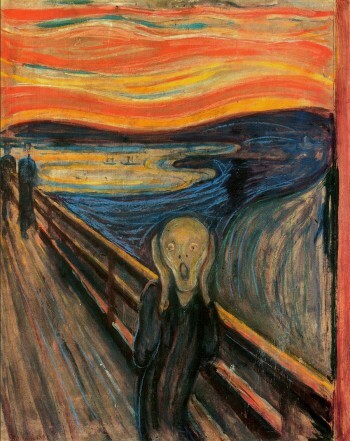 The night looked like one of Van Gogh’s more dreary paintings! In the distance, the electric air and the kaboom of the lightning, probably caused the dogs around the city to bark and howl, which only made things that much more eerie! And as I said, the spirit would answer simultaneous to the lightning flashing. So I would ask something concerning whether I was Hitler or Jesus, and other such things. I could perceive no time delay between the lightning flash and his answer (in my mind). His answers would be either “yes”, or “no”. If he didn’t want to answer, he didn’t say anything. I’m not sure how many nights this went on. Maybe just that one night. But I was bombarded with guilt over the miscarriage I caused, which resulted in the death of Mother Mary’s reincarnated soul. Of course by now, I didn’t know what to believe at this point. This spirit was as changeable as a fickle teen-ager. One night, Becky and I were going to her Father’s church service. He had a very active church, which met seven nights a week, plus twice on Sunday! And as usual, there was nearly a full house, on this weeknight service. Of course I couldn’t understand anything they said. It was all in Spanish. But there was lots of music, and singing, and hand-clapping. After lots of music and singing, it came time for Papa to begin preaching. During the service, the lightning began to flash outside. They had left the entry doors open, so I thought I would use this opportunity to ask the spirit more questions, and wait for the lightning and the spirit’s response. I figured that such a holy place as church might be the perfect place to get the answer I needed. And so I would look back at the open doors and ask a question, and wait for the lightning to flash. Now I can’t remember exactly what was happening right at the moment, as far as the church service. But I distinctly remember asking the question “Did I really kill the Mother Mary?” The lightning would flash, and an answer would come. And as I recall, I repeated this question several times. “Did I kill Mother Mary?” And about the second or third time…as soon as I asked the question, The spirit shouted, “NO-O-O-O-O-O! !”… and simultaneous to his answer, both the lightning and thunder cracked so loud, it was blinding and deafening. And at that very same time as that answer, the lightning completely turned the neighborhood white with the loudest crack you have ever heard! And at the same moment, the lights went out in the church and went completely out in the entire neighborhood! The lightning had caused the lights in the church and throughout the neighborhood to go completely out! Now I was convinced that somehow the spirit had control over the lightning, in some way. Of course, the power outage brought the church service to a screeching halt! The noise of the ceremonies was quickly replaced by questioning voices throughout this sanctuary. At least for 20 or 30 minutes, the service had ended until the power came back on throughout the neighborhood. Until it did come back on, everyone went outside the church in order to wait. As I said, the spirit shouted “NO-O-O! !”, in-sync with the lightning flash and the neighborhood power-outage. This was a loud answer from Heaven, as far as I was concerned. “No” came the answer I was hoping for. “NO” I didn’t kill Mother Mary. But then the spirit began to somewhat confuse the issue by saying, “Did God say “NO!”, or did He say “KNOW!”??? GOD NOT A MAGIC GENIE! Well, I suppose this lightning storm put the “final lid down tight” on all this “Me killing Mother Mary” nonsense! But also, this excursion to “Fantasy Island” put the final “cork in the bottle” on all this idea about God being some sort of a Ponzi-scheme, in which you stroke some brass lamp, and “VOILA!”, a magic genie appears and offers you three wishes! No, there was no mystical experience! No earthly riches! No promise of future glory! Only the knowledge of what a miserable wretch and scoundrel I really had been through much of my “adult” life! This was more than just a bumpy ride! This was an excursion to No-Where’s-Ville!